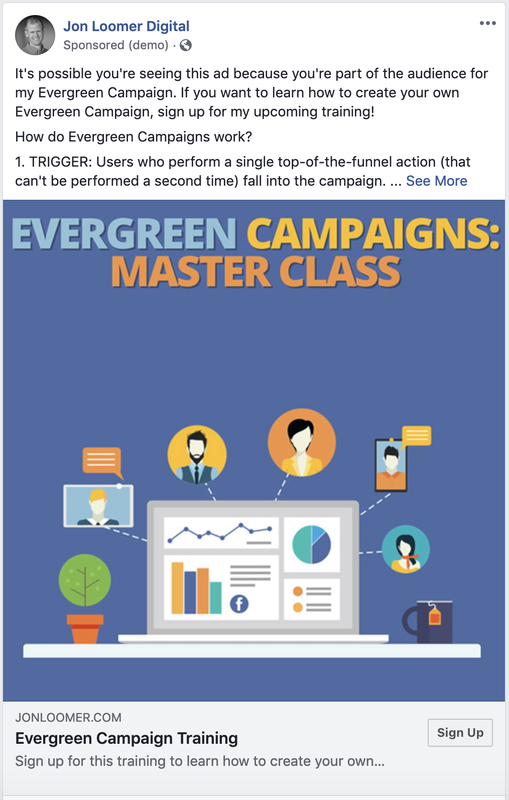 What Are Evergreen Facebook Campaigns? Your campaign works great for a few days. Sometimes a few weeks or even months. But then, inevitably, it hits a wall. Why? In most cases, this can be attributed to ad fatigue. You ultimately start showing the ads — even if you change creative — to the same group of people. You exhaust those who are most likely to act. 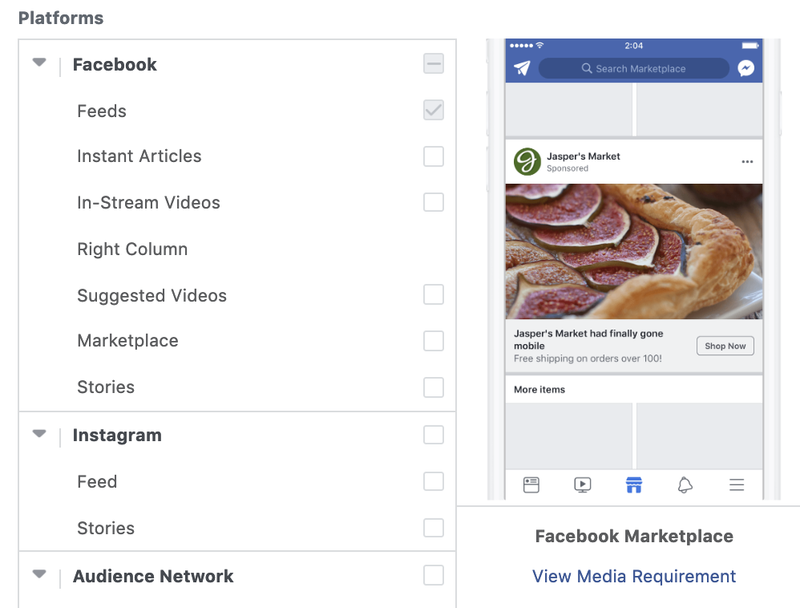 Evergreen Facebook campaigns are effective because, while they might run for months at a time, you can limit how long each user is shown ads within it. And you can show a series of ads in sequence, like a drip campaign, to convey a message. 1. TRIGGER ACTION: A trigger action is an action that a user will only perform once. Typically, this may be a registration or even a low-level purchase. Ideally, it’s an action that has some volume, and you have the goal of some greater action later. It’s important that a user performs this action only once and can’t do so again. Why? Because every time they perform that action, they go through the evergreen Facebook campaign again. That’s what makes registrations and small one-time purchases ideal. They are easier to control. While you can use reading a blog post or watching a video as the trigger action, you need to get creative to make sure that if they read or watch again, they don’t restart the process. 2. 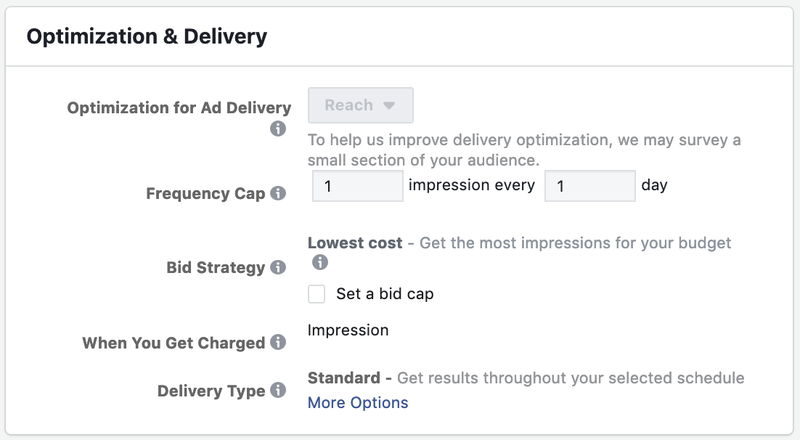 DURATIONS: Evergreen Facebook campaigns work because of Custom Audience durations. What is this? It’s the length of time someone remains within your audience after performing a particular action. In the hypothetical example above, you are creating an audience of all people who hit the thank you page following registering for a webinar during the past four days. That is a rolling four-day window. Someone can’t register for it twice (good trigger!). 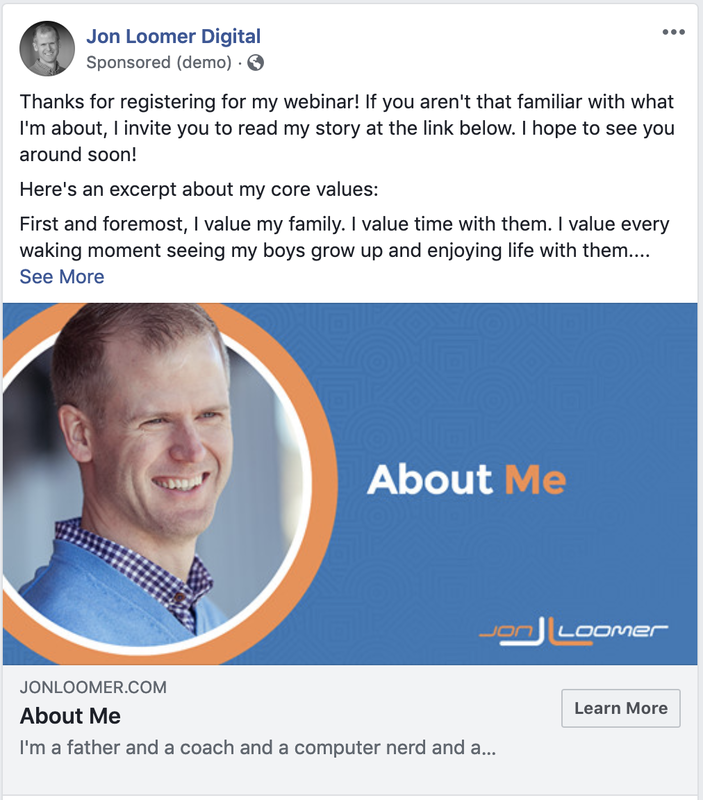 So here, you can imagine creating an ad set that targets this audience — all people who registered for your webinar during the past four days — with a particular ad. Since this audience updates dynamically, people will only see the ad for up to four days, and a new audience will constantly see it as new people register. 3. EXCLUSIONS: Exclusions are one of the most important and under-utilized strategies in Facebook advertising. They are critical to the effectiveness of evergreen Facebook campaigns. First, you can exclude people who already performed the action you are promoting in the ad. Whether it’s reading a blog post, watching a video, or buying a product, there’s no need to show people the ad after they perform that action. Second, exclusions allow you to create a series of ads in sequence. For example, what if you wanted to show two ads in sequence, each for four days, following the registration for your webinar? You don’t have to stop at two ads. You could go on and on and on, showing a specific ad to people at specific points in their journey through the campaign. The trigger action that I use for my current evergreen Facebook campaign is registration for my free webinar. There are two ways that I can target these people. People registered both on my website and via Facebook lead ad forms. As a result, I could target registrants via a Website Custom Audience of the thank you page following registration on my website as well as the engagement audience of those who registered via the lead ad form. Note that I’m also running a similar evergreen Facebook campaign for people who participated in a quiz that I’m doing. That one functions almost the same way, so I’ll focus on the webinar example here. As you can see in the image above, I decided on durations in multiple of five for this campaign. No real reason. I actually went with four for the other campaign that targets quiz participants. That means I can show people a new ad every five days. My campaign can run beyond 40 days for some people (showing eight very different ads). I like to start with an About Me post, telling the new registrant more about me and my business. Note that I’m not selling anything here. I’m taking a long-tail, soft sell approach. You don’t need to. If you wanted, you could go straight to the sale. Promote something related to the trigger action. 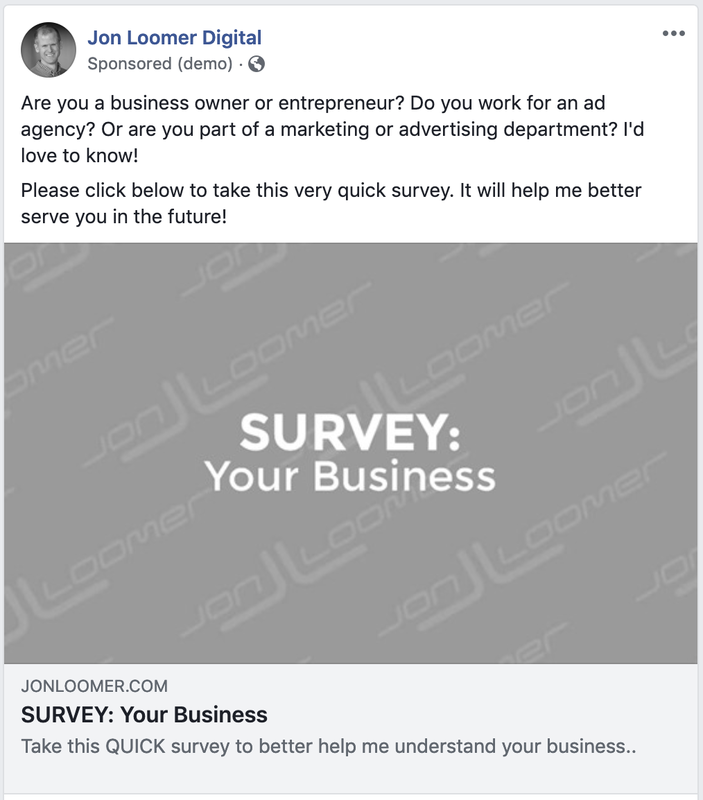 During days 6-10, I show registrants an ad that includes a survey. 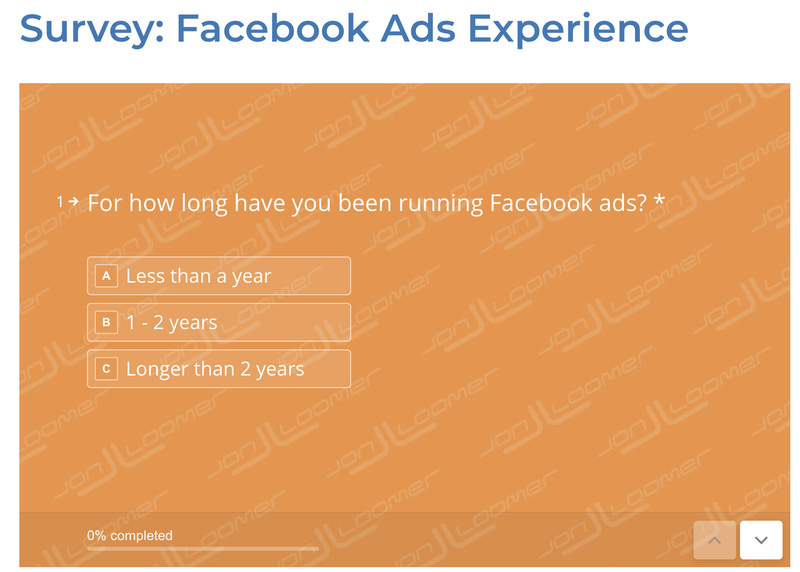 This survey occurs on my website and asks questions about your experience and comfort level with Facebook ads. This is useful information generally, but I also use this for targeting later. You see, I’m able to create audiences of people based on their answers. 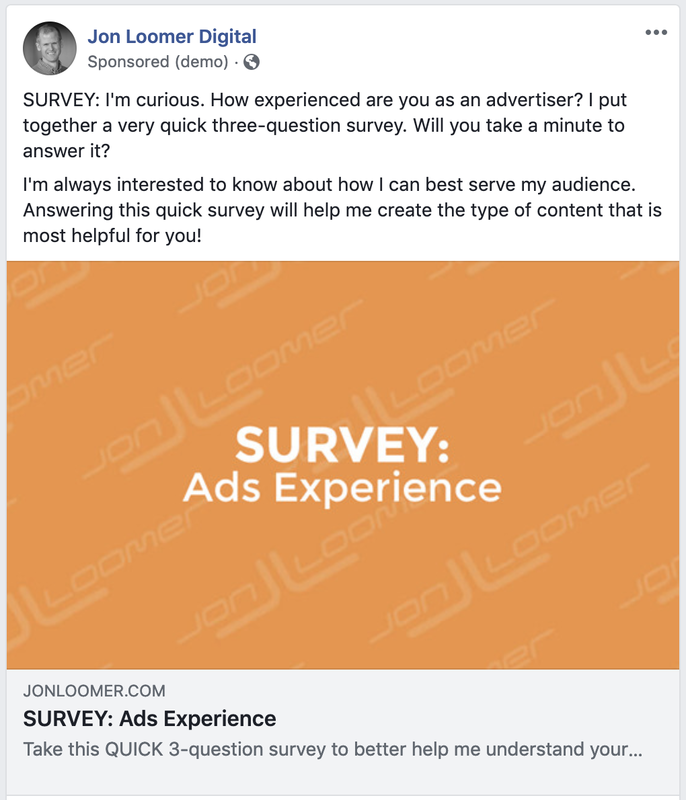 My next ad, during days 11-15, features another survey. This time, I want to know more about your business. I want to uncover who is a business owner or entrepreneur. I’ll be able to target those people later in this campaign (and in other, separate campaigns). Next, I showcase a quiz during days 16-20 of the campaign. 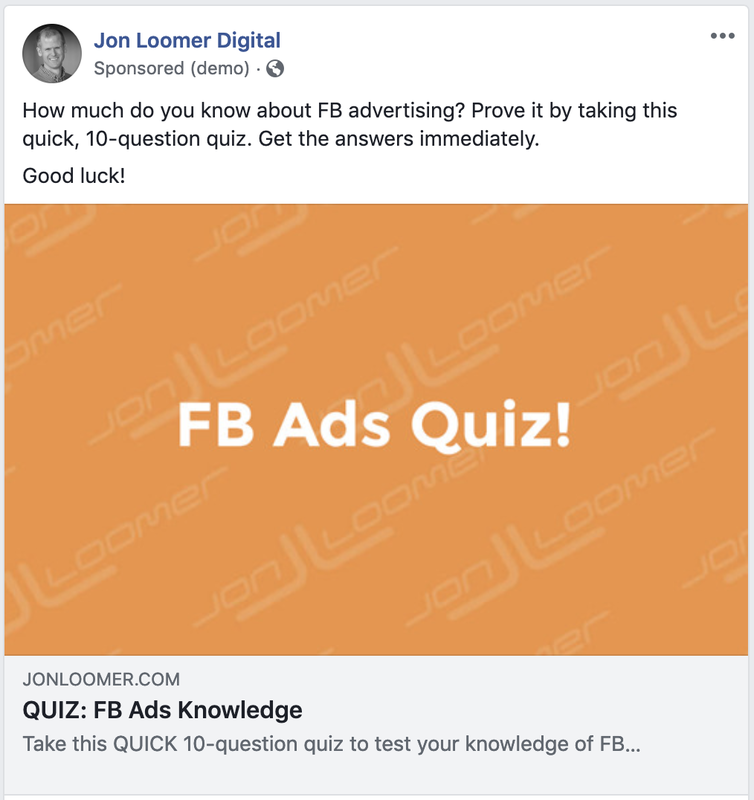 This quiz tests you on your knowledge of Facebook ads. Similar to the survey, I can use this information for later targeting. 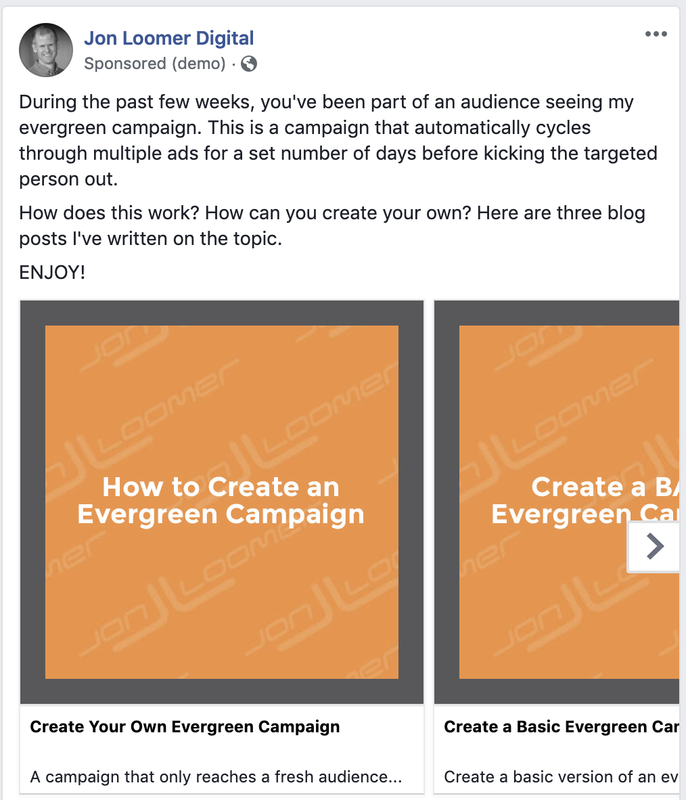 During days 21-25, I utilize a carousel to showcase three blog posts I’ve written about evergreen Facebook campaigns. The hope is to get you interested in this approach. During days 26-30, I promote my upcoming Evergreen Campaigns Master Class. 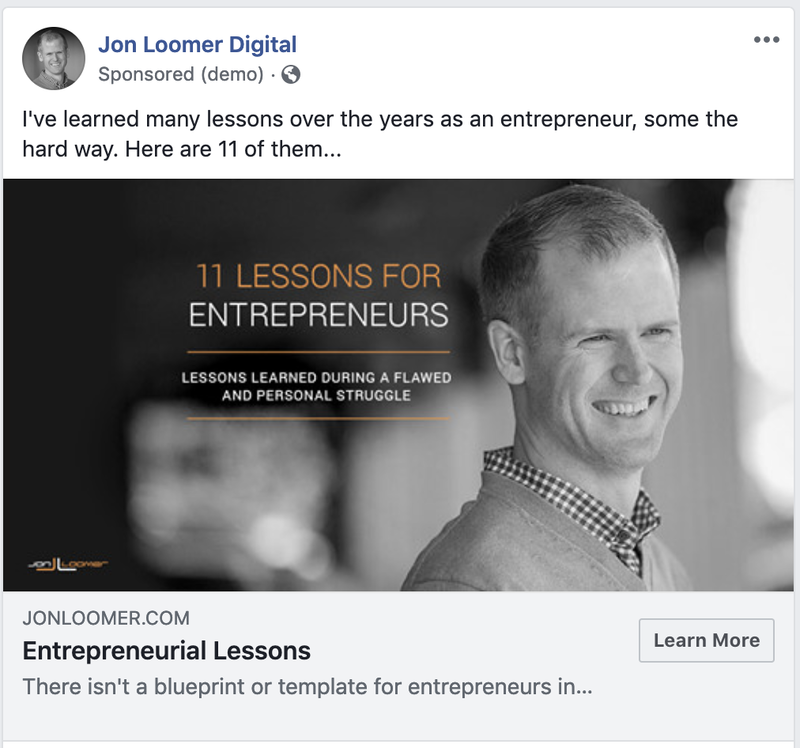 Since creating evergreen Facebook campaigns is a more advanced strategy, I don’t want to show this ad to new advertisers who are just getting started. It is bound to be over their head. I will promote my PHC – Elite private community during days 36-40. This is also the ad that will run in place of promoting the training after the training is complete (since members can get access to the recordings). Once again, we’ll exclude beginner advertisers and current PHC – Elite members from this audience. From there, the “base” evergreen Facebook campaign is complete. If you don’t sign up for the training or PHC – Elite after those first 40 days, you’ll stop seeing the ads in this campaign. This thing can keep going and going, depending on what you want to do! 1. Do you have lots of volume of trigger actions? 2. How important is it that you reach everyone who performs the trigger action? If you have plenty of volume or don’t feel the need to reach everyone, you can optimize for a specific action, like a purchase. But if volume is low or you are determined to reach a high percentage of people within the campaign, you might optimize for Reach using the Reach objective. That’s typically my preference, capping frequency at once per day. Of course, what you do here coincides with your choice for optimization. If you optimize for an action like purchases, your options for placements are wide open. Do what works for you. But, if you optimize for Reach and use a frequency cap like I do, limiting placements would be a good idea. Why? If you cap your frequency, you don’t want to waste an impression on a less effective placement (like the right-hand column or Audience Network). I focus on the feeds only for the purpose of this campaign. If you want to learn more about how you can create your own evergreen Facebook campaign, sign up for my training! It occurs this Thursday, February 28. While the training is live, you will also get access to the replays. If you miss my training and still want access to the replay, join PHC – Elite, my exclusive membership. 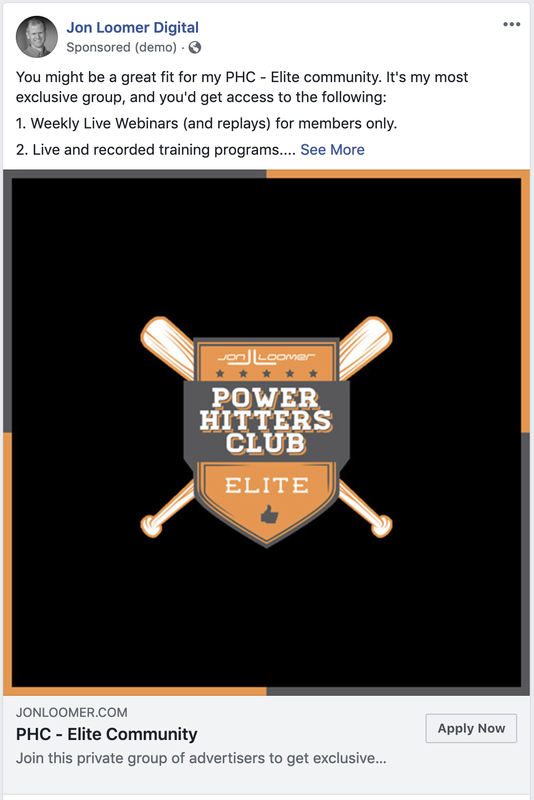 PHC – Elite members get access to ALL of my training replays (as well as live training, weekly webinars, a private Facebook group, and more). This is how my evergreen Facebook campaign works. Have you ever done anything like this before? How does yours work?